Choosing a driving school – Are you being scammed? The reality is that the economy pinch is being felt in all industries and the driving school industry is no exception. The first scams come in when you call the driving school and continue throughout the process until the student is qualified. The reality of driving schools in South Carolina is that all driving schools are regulated by the DMV. Our driving school instructors have had a criminal background check. TRUTH – all driving instructors in South Carolina have to have a clean criminal (SLED) background check before the dmv will issue an instructors license. Our driving school provides an insurance discount certificate. TRUTH – all driving schools in South Carolina provide a PDLA form (DMV form) on completion and this is accepted by all insurance companies – Greenville Driving School issues an additional insurance discount certificate to make this process easier for you. Our driving school teaches an 8 hour classroom session. TRUTH – all driving schools in south Carolina teach the 8 hour class, it is mandated by the DMV. Our driving school teaches a 6 hour driving / behind the wheel course. TRUTH – all driving schools in South Carolina teach the 6 hour driving course, it is mandated by the DMV. Our driving school teaches a defensive driving course. TRUTH – all driving schools in South Carolina should be teaching this. Our driving school has cars that are equipped with safety equipment, etc. TRUTH – all driving schools cars in South Carolina are equipped with dual controls, it is mandated by the DMV. Our driving school cars carry additional/special insurance. TRUTH – all driving school cars in South Carolina carry additional insurance, it is mandated by the DMV. Our driving school instructors will pick the student up from school/home and drop them off at school/home after the driving lesson. Our driving school teaches over the weekends. Now just ask the driving school what makes them different from any other driving school and listen to the sales pitch. The reality is that there is almost no difference between the driving schools. So then ask why should you be paying $450, $420. $399, etc, etc when you can go to Greenville Driving School for $299? See what response you get. This is where the driving schools show their true colors, after all how could they possibly justify the additional expense? Here you will often hear a story about what is wrong with another driving school. Do you really want to send your child to a company that has a bad attitude about the competitors and can only get customers by degrading their competitors? I certainly would not. The reality is that all driving schools are very closely monitored and controlled by the DMV and if there was anything wrong with a driving school it would be shut down by the DMV immediately. OK, so now let’s look at the scams that are out there taking more money out of your pocket. If a driving school is having difficulty making enough money and they are not attracting enough customers, the only way to make more money is to extract as much as possible from each customer they have. This is a tough economy and some driving schools are not making it, some have had to close down, but that’s no reason to scam the customers for more money. A driving school teaches a pre-permit course. At Greenville Driving School this is FREE!! TRUTH – this is service you do not need. For the student to get a permit all you need to do is go to the DMV, get a free drivers handbook (also available from the DMV website) for the student to study and then the student can take the knowledge test at the DMV once they have turned 15. A driving school takes your child to the dmv for the road test. TRUTH – this is service you do not need. The dmv requires a parent to sign documentation for a minor taking the road test, so this you can do when you take your child for the road test. There are dmv offices that are open on Saturdays for the road test. Greenville driving School offers the testing on weekends if you test through greenville driving school using the driving school car and the driving school examiner. A driving school allows the student to use the driving school car for the test. TRUTH – this is service that most driving schools offer if you test through the driving school. 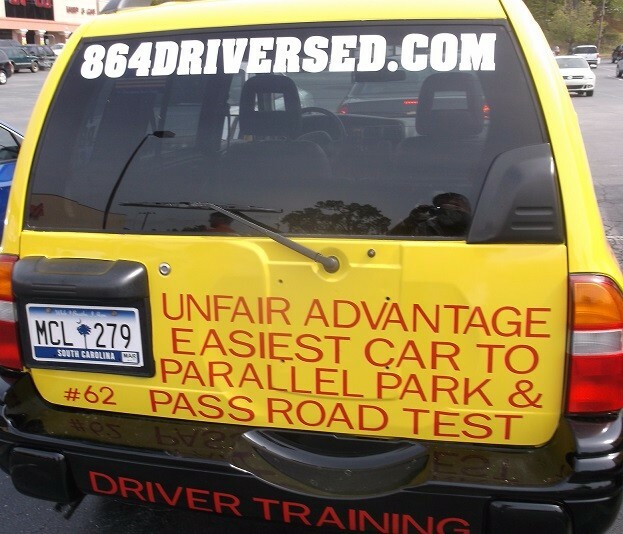 Greenville driving school has the easiest cars to parallel park of all the driving schools. Your child needs an additional lesson. TRUTH – the instructor tells you your child needs additional lessons – what parent would not spend more money? This is a disgusting scam, as a parent you have no idea what your child has been taught or not taught on the driving lessons. If your child is a fair driver before they come to the driving school there is no reason why the instructor can not get the student to level where they can easily pass the test in the allocated 6 hours. 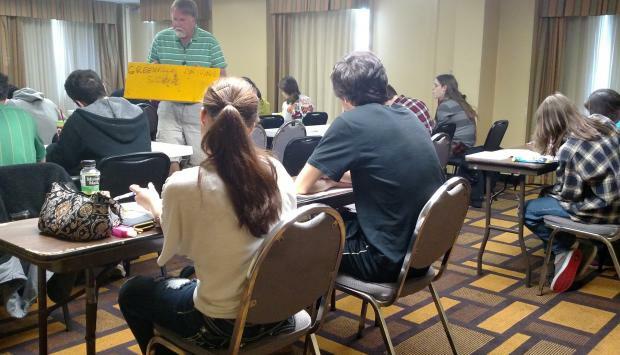 But many instructors do not concentrate on the tasks the student has to master for the test, preferring to aimlessly drive around for the 6 hours and then request more money for additional lessons. Greenville driving school does not offer additional lessons. What we do is to meet with the parents at the end of the first lesson, go through the lesson and the students good and lacking strengths. We provide the parents and students with a action plan for practicing before the second lesson. We provide study notes and a dvd of the test to ensure that the parents and student can easily practice for the test in the students vehicle. Once the parent feels the student is up to testing level we will proceed with the second driving lesson and correct any final mistakes. This way you do not need any additional lessons and additional fees. A driving school refresher lesson before the road test. TRUTH – this is service you do not need. The student must hold the permit for a minimum of 180 days before taking the road test, so the correct way to do this is to have the student start this course as soon as possible during the 6 month window. This way we teach the student the correct way to drive for the test. Other driving schools will teach all 6 hours ASAP. If the student then still has several months before the test, they will more than likely find it difficult to pass the test, hence the need for an additional lesson. At Greenville Driving School you pay for the driving lesson when you take it. So, don’t take the second driving lesson until just a few days before you take the test – that way its fresh in the students mind and passing the test is a lot easier. Our instructors have law enforcement experience and that makes them better. TRUTH – Greenville Driving School has employed law enforcement instructors and has chosen to move away from this type of instructor. We believe that the students respond better to a gentler and less intimidating instructor. At Greenville Driving School, we have seen better results from non-law enforcement instructors with our students.